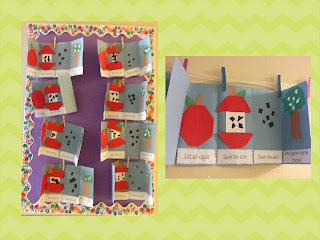 We did a few more apple activities. On Thursday we celebrated Johnny Appleseed's birthday. We even watched the short Disney video on youtube. 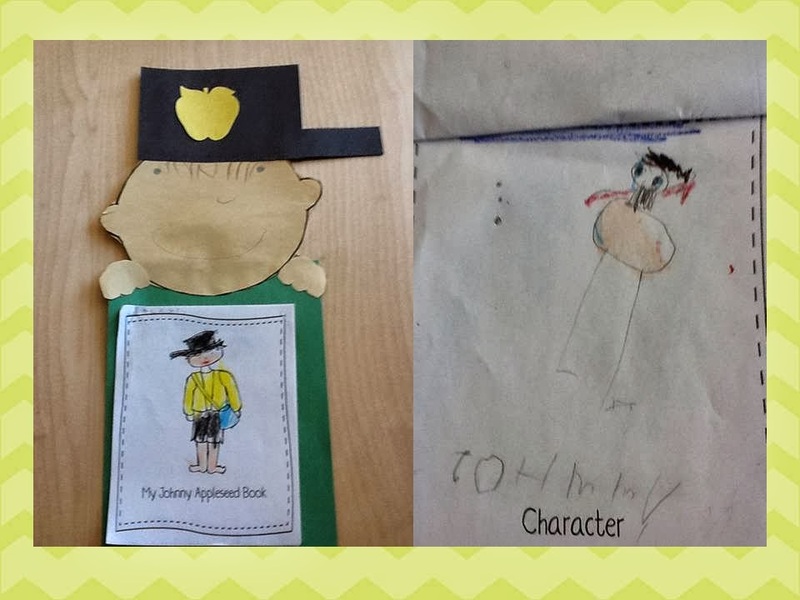 We made this adorable Johnny Appleseed craft. He is holding a book that includes character, setting, main idea, and favorite part. I LOVE how it came out. Several of my students wrote (copied) the word Johnny on the character page. 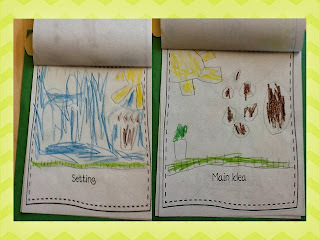 Some of my kids really get the idea of using multiple colors and adding details to the illustrations. 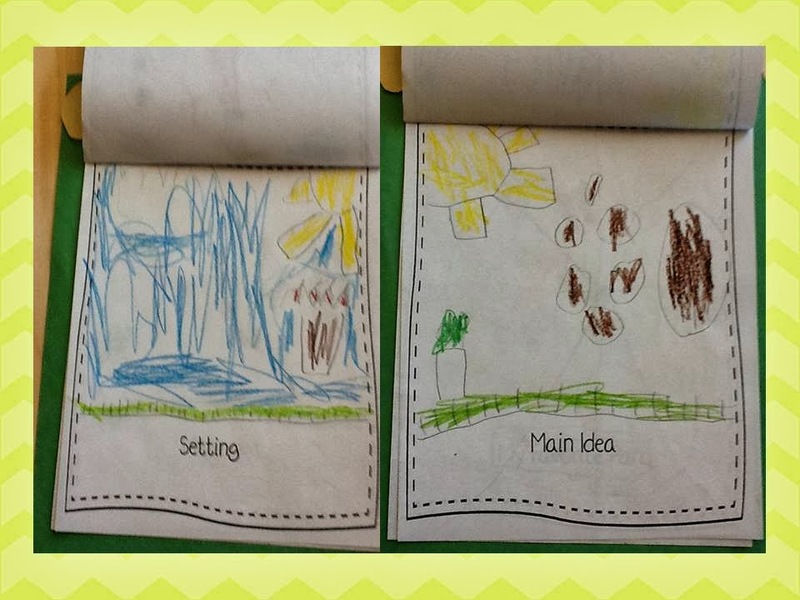 We talked about the setting being outside and what outside would look like. I modeled it based on the details they provided, sun, trees with apples, the sky, and grass. We have been talking a lot about what good coloring looks like.. Many of my sweeties are still scribbling with one color. I think we need to keep talking about it. I was really impressed that many of them understood that the main idea was Johnny walked around the country planting apple seeds. Yes, those big brown circles are apple seeds.I forgot to take a picture of the favorite part. Several of my kids liked that Johnny Appleseed was barefoot. I think that was my favorite part. This was a cute poem and craft came from Deanna Jump. 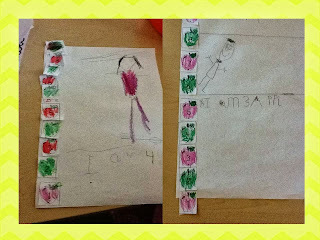 It is a great fine motor activity and my kids loved it. Finally, in math, we cut out apples with numbers 1-10 on them. 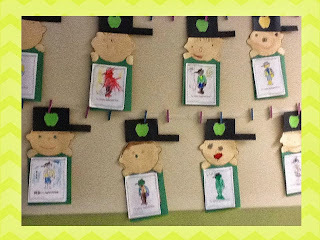 They glued them in order and then colored them. Then I instructed them to draw themselves. 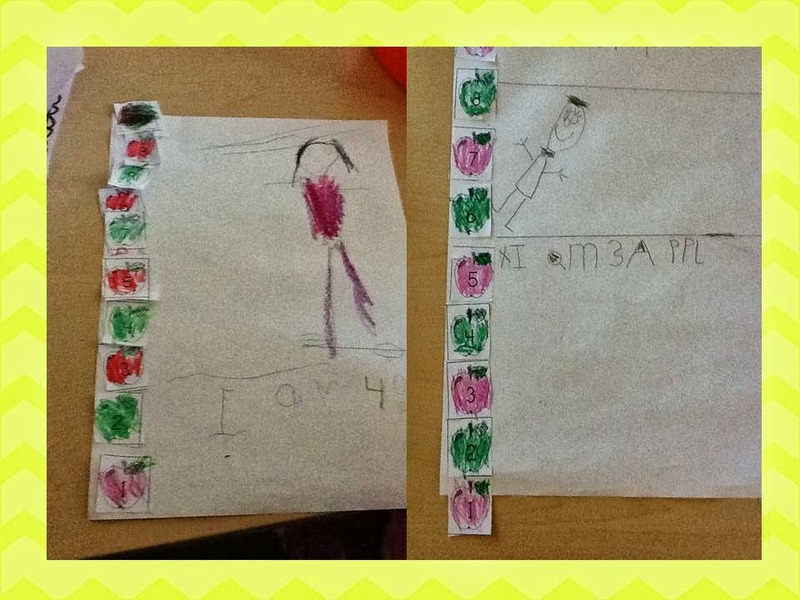 I wanted them to see how many apples tall they are. I forgot to tell them to draw themselves from the bottom. Oops! I broke out the rulers and we drew lines to see how tall they are. It is hard to see, but they wrote, I am ___apples tall. Next up, Hot Air Balloons! The Albuquerque Balloon Fiesta starts Saturday, October 6th and I will be giving away Hot Air Balloon freebies during the Balloon Fiesta all next week!